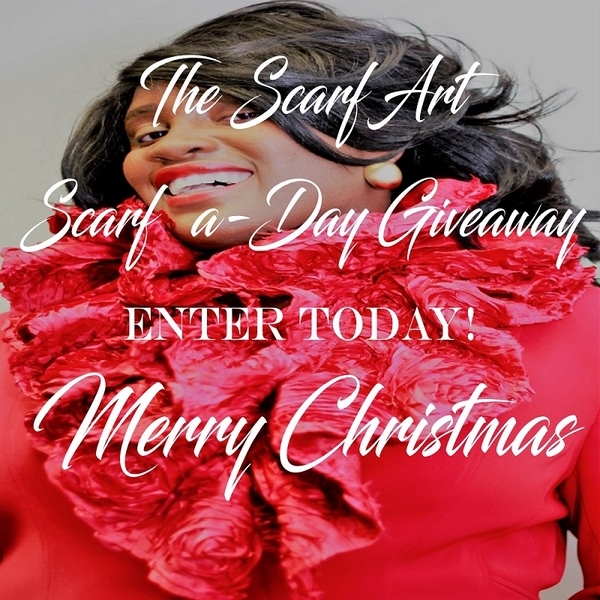 DALLAS, TX, December 11, 2017 /24-7PressRelease/ — In honor of Christmas, we are giving away a Scarf Art product per day starting Monday, December 11th thru Saturday, December 23rd, EXCLUDING SUNDAYS. Ladies, this is our biggest giveaway to date! We can’t think of a better time to do this than the holiday that honors the birth of Christ. If you are a current customer, this is a great time to add to your Scarf Art collection and maybe try a new design. If you are new to Scarf Art, this is a great time to throw your name in the hat to try our products. Scarf Art products were created for women who are challenged by scarf tying or love scarves but don’t have time to tie them. Our products give the illusion of a self-tied scarf. They are the female equivalent to the Clip-On Tie for men. Scarf Art products are “Pre-tied for you, just button and go!” Visit our site, WWW.SCARF-ART.COM to checkout the wide variety of pre-tied, pre-designed products & fabrics, Ruffle Collars, Chic Neckerchiefs, Large & Small Nautical Squares, Chokers, Fishtail Chic Neckerchiefs, Scarf Vest and more! Our products are fashionable, functional, attactive, affordable and user-friendly. Scarf Art is great for every aspect of life, work, church, casual and special occasions. We will have a winner each day (EXCLUDING SUNDAYS), therefore, YOU have 12 opportunities to WIN! TO ENTER, simply email us, [email protected], Subject Line: “MERRY CHRISTMAS”. When you win, you will be notified via email to collect your shipping address and instructed to go to our website, WWW.SCARF-ART.COM, to select your prize. As well, the names of ALL the winners will be posted on social media. Feel free to “pay it forward” by sharing our “Daily Scarf Giveaway” with your co-workers, family and friends. ENTER & WIN a Scarf Art Product starting December 11th thru December 23rd, WWW.SCARF-ART.COM! Scarf Art Pre-tied Scarves creates, manufactures and sells pre-tied, pre-designed fashion scarves for women who are challenged by scarf tying and love scarves but don’t have time to tie them. Scarf Art products are the female equivalent to the male Clip-On tie. Our products give the illusion of a self-tied scarf. Scarf Art Products “Pre-tied for you, just button and go!” The Scarf Art Collection includes a variety of 15 pre-tied, pre-designed fashionable scarves. Scarf Art products are functional, fashionable, attractive, innovative, affordable and user-friendly. Visit our website to checkout our products, WWW.SCARF-ART.COM.